G.S. DUNHAM is a small, specialized company with over 250 years of combined product service experience. G.S. 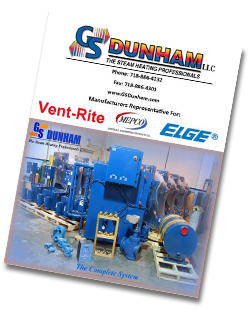 DUNHAM was founded in 1995 by Bill Gribbin and Joe Stropoli with a mission to provide the best steam heating products and services in the NYC/NJ metro area. But the G.S. DUNHAM story doesn’t really begin in 1995. The story of G.S. DUNHAM goes all the way back to 1897 when Clayton Dunham invented the first commercial thermostatic steam trap. This simple invention changed steam heating forever. From those humble beginnings grew the C.A. Dunham Company which morphed into Dunham-Bush and finally, MEPCO. Along the way they revolutionized steam heating systems around the world. Being steam heating experts themselves, Bill and Joe were well aware that MEPCO (Dunham Bush) products were the industry standard. So when they founded G.S. DUNHAM, they became the exclusive manufacturer’s representative in NYC for MEPCO products. Later, VentRite® and ELGE® were added to complete the portfolio of products. Over the years, G.S. DUNHAM has grown into the area’s top steam heating professionals working with large, medium, and small-sized systems. The G.S. DUNHAM difference is our unique ability to support the best products with the best service. G.S. DUNHAM prides itself in understanding inter-connected components and engineering ways for them to work effectively together. If it is used in steam heating systems, we have it, understand it, and support it. And only G.S. DUNHAM has the expertise to make it work effectively and efficiently.